After coloring our birthdays white and pink, we thought it was time to pull out the blue crayon for the next birthday celebration. 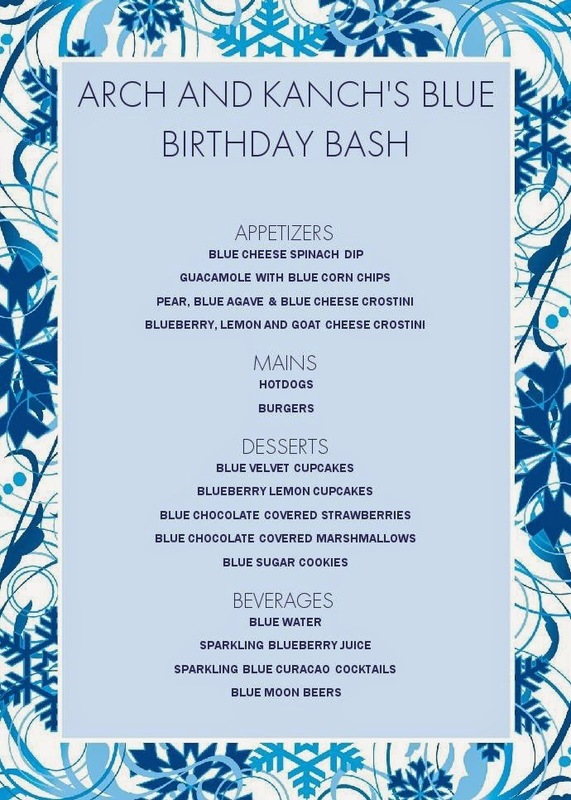 Blue parties are not just for little boys! 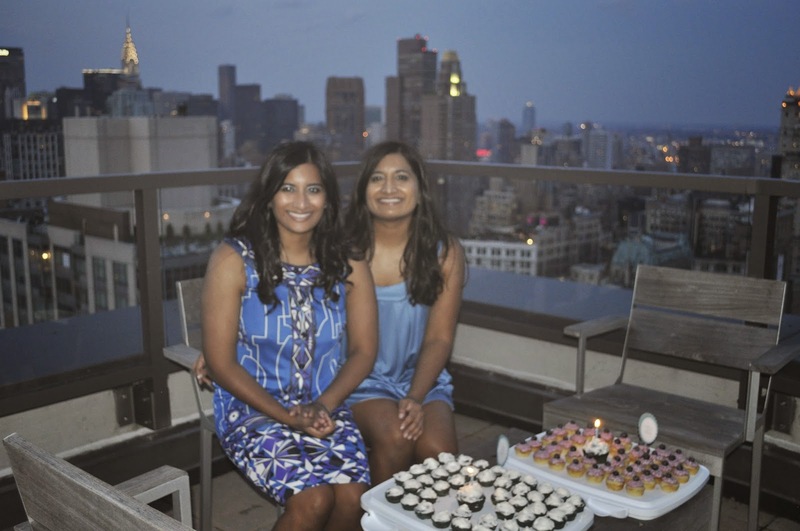 Blue is a great color for a summer party as it instantly reminds guests of beach waves and bright skies. Plus blue 32 has a nice ring to it! Crafting this menu was infinitely more challenging than our prior two parties. There just aren’t that many foods naturally colored blue. After brainstorming, we realized that with a little bit of creativity we could create a delicious menu. We incorporated blue colored foods AND items with blue in the name. 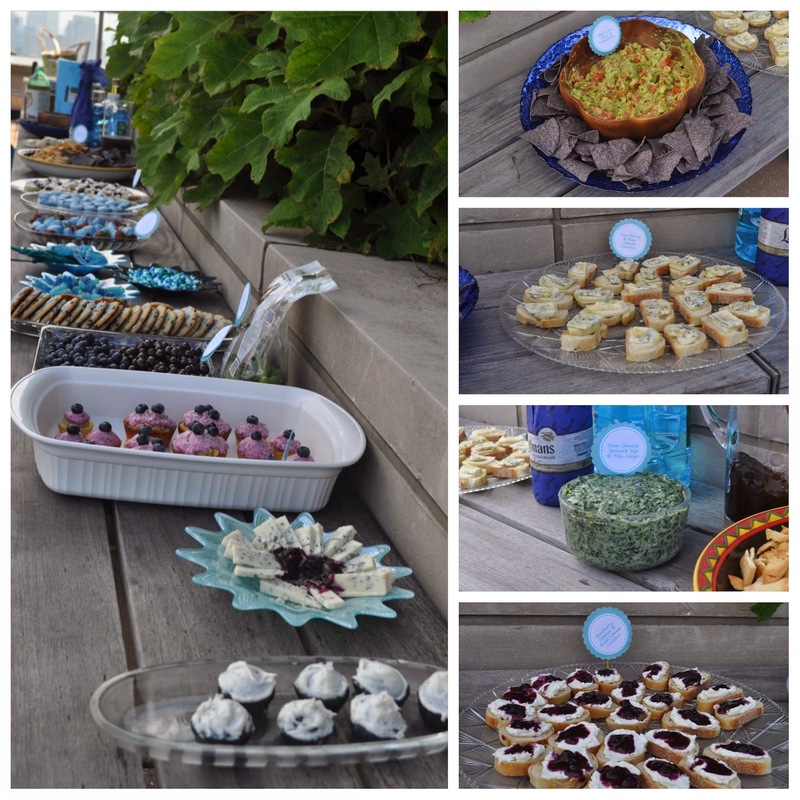 We served pear, blue agave and blue cheese crostinis; blueberry, lemon and goat cheese crostinis; guacamole with blue corn chips; and blue cheese spinach dip with pita chips. These cold appetizers can be made in advance and put together rather quickly before guests arrive. We also grilled burgers and hot dogs throughout the night. 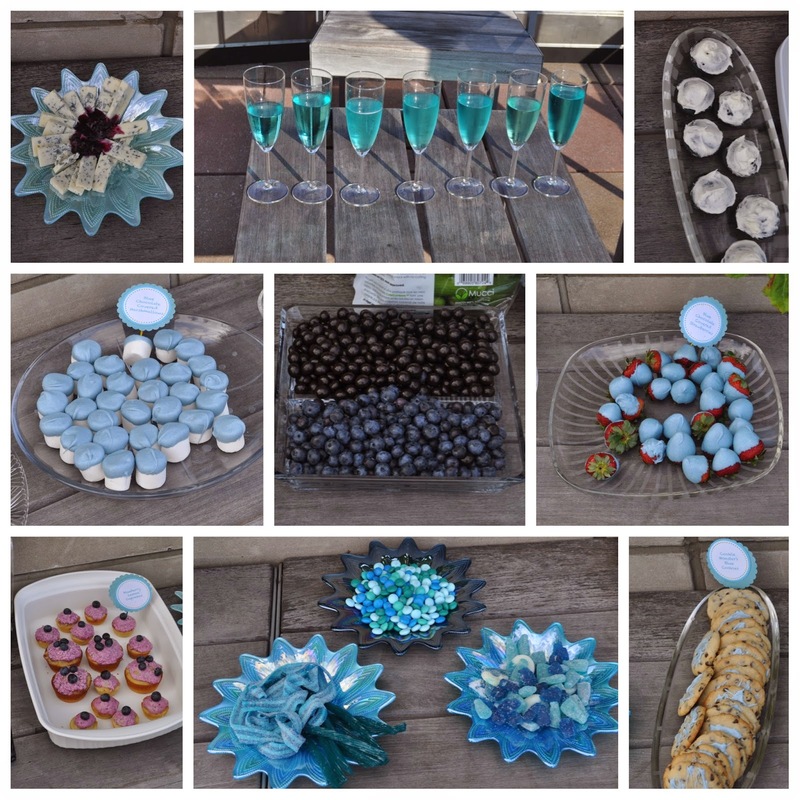 We received blue star shaped platters as birthday presents and used them to display our blue desserts. The dessert bar featured lots fruit: blueberries, chocolate covered blueberries and blue chocolate covered strawberries. Our cupcake flavors were blueberry lemon and blue velvet. We also served blue chocolate covered marshmallows and chocolate chip cookies with blue chocolate drizzle. Another guest added blue specialty candy from Dylan’s Candy Bar to the dessert table. The children at the party were stuffing their little faces with the regular blueberries until they discovered the chocolate covered ones. Then we had to quickly move that plate out of their reach. Processo, white cosmopolitans, rosé and strawberry Pimm’s cups were easy additions to our beverage menu at the prior parties. Unfortunately, there is no blue wine but there are Blue Moon beers! Our specialty drink was a sparkling blue Curaçao cocktail. The drink was a stunning shade of blue. It was beautiful to photograph and everyone wanted a glass. You should definitely expect more people to try a specialty drink – even those who tend to stick to beer or wine will usually want at least one! Blue was an excellent choice for 32! In typical male fashion, some guys forgot about the color theme but arrived accidentally dressed in blue anyway. Previous Post Eat, Drink and Be Green! Next Post Talk Derby To Me!